A generous display of the indefatigable British critic’s wares: nearly 70 informed, eloquent, and endlessly stimulating book reviews and literary essays. They’re grouped mostly by genre and nationality—and there are few fields of interest about which this ineffably generous uncommon reader doesn’t have something interesting to say. Rummaging through “English Literature,” he celebrates the productively “divided natures” of Dickens and Hardy, Trollope’s mastery of the quotidian, and the achievements of those “self-created” geniuses George Orwell and T.E. Lawrence. Perusing “The English Poets,” he notes Keats’s appropriation of “the Shakespearean spirit,” and gives overdue homage to Tennyson in a penetrating assessment keenly sensitive to the poet’s ingenuous impetuosity and very real greatness. “Mother Russia” gathers knowledgeable appreciations of Pushkin’s profound influence on the 19th-century novel, the unjustly neglected Ivan Bunin (whose “descriptive prose is alive in the same absolute sense as that of D.H. Lawrence”), and those indigenous, ultimately un-translatable great poets Anna Akhmatova and Marina Tsvetaeva. 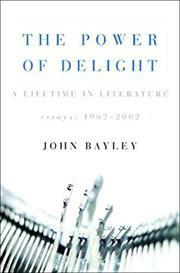 Bayley seems less astute on “American Poetry,” though he responds strongly to Whitman’s infectious ebullience, and memorably pinpoints the elusive John Ashbery’s poetic method as “romantic alchemy.” Few could match his comprehension of 20th-century writing “Out of Eastern Europe”—or have developed the rich variations he works on the observation that “so many European poets, who . . . [endured] the Second World War, have written in consequence a poetry of extreme simplicity and precision”—in revelatory analyses of Paul Celan, Zbigniew Herbert, and Czeslaw Milosz. Further brief pieces praise Stendhal’s salutary egoism, Angela Carter’s inventive feminism, the intellectual symbiosis shared by Henry and William James, and intellectual combat that kept Leo and Sophia Tolstoy together (and apart), and, in a fine ending essay, Gore Vidal’s brilliant memoir Palimpsest. Bayley is England’s Edmund Wilson, and reading him on reading others truly is an education.